Hello to You and Happy Iceland Wedding Planning! What alcohol can you bring into Iceland? …and how much can you bring? What alcohol is made locally in Iceland? 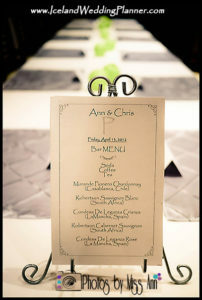 What selection of liquors, beers and wines may be available for your Iceland wedding reception? 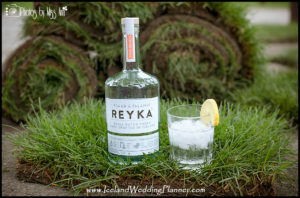 What are the prices you may be expected to pay for your Iceland wedding reception alcohol? Many items of alcoholic content are imported into Iceland and may be more expensive than other locations you may have visited. An alternative option may be to bring your own wedding champagne or specific alcohol so that you may save within your Iceland wedding budget. Real Wedding in Iceland Example: When we held our Iceland destination wedding adventure at Seljalandsfoss waterfall, Vik Beach, and Skogafoss waterfall we knew that purchasing champagne for 40 people was going to be expensive. 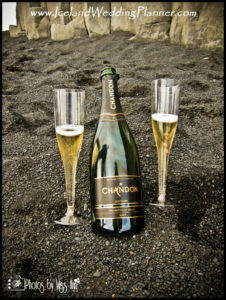 For instance, if we would have purchased 10 bottles for our 40 guests (based on 4 glasses per bottle) to do our wedding champagne toast at Vik Beach it would have cost us $1,500 USD (if we purchased house champagne at Hotel Ranga). Chris and I decided that those funds would be better spent elsewhere in our Iceland wedding ­budget but did want to still have a champagne toast for our guests during the sightseeing excursion. After further research, we found that each person could bring 3 bottles of wine OR 1 bottle of wine and 1 liter of alcohol. So we spent a weekend wine and champagne tasting in Napa Valley (see one of our destination engagement sessions we have done in San Francisco/Napa Valley, here) and found a delicious variety from Domaine Chandon in fact, it was their vintage reserve brut from 2007. We bought a case (for only $600 USD) and shipped it home to Plymouth Michigan in anticipation of our April wedding in Iceland at Seljalandsfoss waterfall. When we packed our bags for our Iceland destination wedding, we made sure to bubble wrap the bottles, and designated a few of our friends to help us abide by the 2-3 bottle per person restriction. Luckily, all of the bottles arrived to Iceland in one piece along with our champagne glasses we also imported (our wedding host hotel was going to charge us $5 USD per glass to rent). Question #2: What alcohol is made locally in Iceland? Answer: Iceland produces some delicious beers at the following breweries: Ölgerðin Egill Skallagrímsson in Reykjavik and Vífilfell. The Reykjavik Distillery is another amazing local option for liquor. They make several schnapps called Brennivin in interesting flavors like: Brennivin 50, Brennivin 64, Blueberry, Crowberry, Rhubarb, Bilberry, and Juniper. They all have organic ingredients like potato, herbs, seeds, Icelandic water, etc. 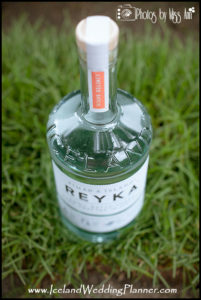 One of the other token alcohols is called, Reyka Vodka. They have such a fun tagline too, “When you live on the edge of the Arctic Circle, you need to know how to have fun.” Ha, love! The company itself is also known for being a “green” vodka because it is produced using sustainable energy. The vodka itself is made from organic wheat and they do a final filtration through lava rock –how fun, right? Questions #3 & #4: What selection of liquors, beers and wines may be available for your Iceland wedding reception? What are the prices you may be expected to pay for your Iceland wedding reception alcohol? Answers: They follow below! <Please note that all prices below are approximations and are also from our direct personal/professional experiences for wedding receptions in Iceland. The list below is also to provide you with an idea of what alcohol could be offered during your destination wedding reception in Iceland. Prices vary depending on your chosen Iceland wedding hotel or restaurant. All prices are featured in ISK (Icelandic Krona) and converted to USD (United States Dollar) as of today’s exchange rate (and by the bottle)>. Side Note: Typically the per glass cost is 1,600 ISK ($13 USD) and for champagne per glass cost is usually around 3,800 ISK ($32 USD). 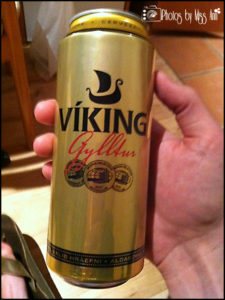 Víking Gold (Gullfoss): Best selling beer in Iceland (type: lager). All Schnapps Available & Mixers (Like Jagermeister, Baileys, Triple Sec, Cointreau, Grand Marnier, etc). All Beers, selected wines, and champagnes. Iceland Wedding Planner Tip: If you’re having an Iceland wedding welcome dinner the night before maybe choose 4 specific wines and beers you will serve with dinner. Having an Iceland Bar Menu helps too! Then for your Iceland wedding reception, keep the options open by the glass (not the bottle) but limit what brands you would like to have served to your guests. Example, we limited our guests to only being able to order 18 years old scotch/whiskey/brandy/ports because Hotel Ranga had some rare whiskey that were 25+ years and more than $75 USD per glass. We had selected as a couple a “do not serve” list of those rare brands and also selected our favorite brands in each mixed drink category. 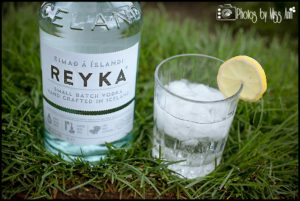 We hope that this blog post today on Iceland Wedding Reception Alcohol will prove to be a useful tool to you as you plan your wedding day in Iceland! If at any time you need assistance planning your Icelandic destination wedding or need an Iceland wedding photographer, we would love to help you! Our packages include Iceland wedding planning and Iceland wedding photography (we’re a husband and wife team: Photos by Miss Ann) allowing us to be your one point of contact for you throughout this amazing process so please contact us for more details!